Don’t you just love steamed Maryland Blue Crabs on a warm summer day? 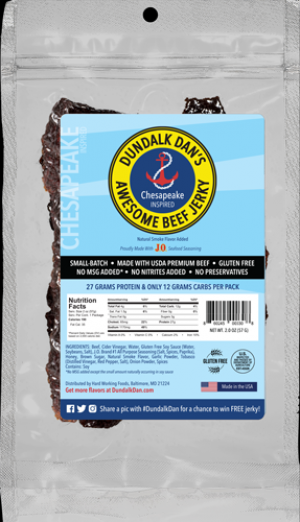 Dundalk Dan's has combined classic beef jerky marinade elements like brown sugar, cider vinegar, honey, Worcestershire, and garlic powder, with a generous portion of the local-famous J.O. Spice #1 All Purpose Seafood Seasoning to create to create a unique taste any crab lover is sure to enjoy. This is their flagship flavor, where they have created innovative jerky flavor experience that will keep you coming back for more. Dundalk Dan's Awesome Beef Jerky is handmade in small-batches producing the highest quality beef jerky. They hand-trim any fat off of the 100% USDA Choice Grade Beef and marinate the strips in our liquid marinades for 3 days, turning the batches every 12 hours before dehydrating and vacuum sealing each package for freshness.